This song grabbed my soul when I was 15 years old. We sang this text in high school choir. I have never found the musical setting of that “Song of Simeon”. When I was 15, I didn’t think to write a composer’s name down. Because I’d love to share it with you. even though some are quite good. I love Simeon’s hands and eyes. 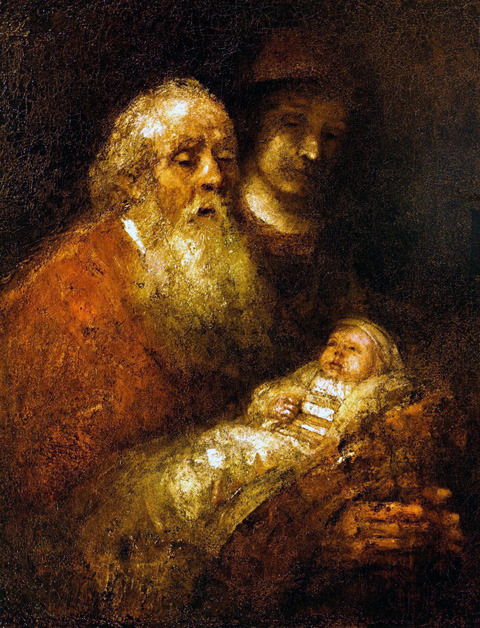 Rembrandt capture’s Simeon’s heart full of joy. This entry was posted in Uncategorized and tagged christmas, fineartfriday, music by alivingpencil. Bookmark the permalink. I love the Nunc Dimitis! We sing is each Vespers and every time a baby is welcomed to church at 40 days of age. I’ve been thinking of praying it with my son for part of his bedtime prayers.I hope you find the setting you remember and loved. I know that feeling. The colors and shadings and hues of this painting are amazing!! Not to mention the way he made the rest of the painting fade in comparison to Simeon’s face-beautiful. Thanks for sharing it with us. Blessings for a wonderful holiday with your family! Love you!!! I love the story of Simeon. This is so uplifting for the day after Christmas! Hope you find your music someday. It will probably come to you when you least expect it. I agree with Deb – it is sung every Vespers and at Churchings, I wonder if you could find an Orthodox Vesperal CD that would have it.And, I also love it, I cry every Churching.